Attention all of you. Today I am presenting you one of the masterpieces of the mobile games world. 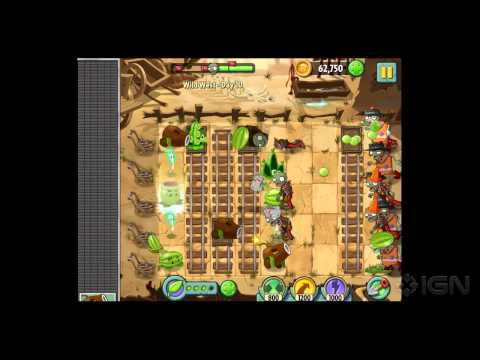 This is Plants VS Zombies 2 published by the PopCap games. Back then when PopCap was first starting they were “ok” until the moment we saw the first Plants vs Zombies game. OH, MY GOD! This was amazing! And the attention to the details is what drove me crazy. Are you kidding me? The zombies instead of ” brains ” were yelling “GRAINS”! And from this day until now I am still playing this game from time to time. Why? Because it is simple, well animated and the most important thing it is FUN! The new arsenal is greatly enhanced by the introduction of Plant Food; useful plant steroid collected during levels which can be banked until you want to use it. Then, when the moment is right and the zombies are closing in, you drag it onto any plant to trigger a unique super attack. A standard Peashooter, for instance, unleashes a concentrated burst of peas down one lane, while the Melon-put lobs a volley of watermelons all over the screen, and the Boomerang sends boomerangs flying horizontally and vertically. It’s a solid inclusion that adds another layer of tactics – you’ll need to consider each unit’s Plant Food ability at the selection screen, as these supers can be the difference between victory and defeat when used effectively. And now let`s see what we have for the gameplay. I am not sure that there is a surprise there. As in the original, there’s no right way or wrong way to play, allowing a rewarding sense of freedom in your zombie-killing strategy. Maybe you like to plant offensive units as early as you can, building your arsenal slowly but steadily, or perhaps you prefer to get your sun economy humming as quickly as possible, using stalling tactics during the first few waves for a bigger payoff later. Maybe your strategy is built around multi-lane attackers, or maybe you’re into high-impact, single-lane strike forces. Of course, you’ll have to adjust your tactics depending on the zombies in each level and the rules in play, meaning that while you’ll have favorites, you’ll wind up using a fair slice of the available arsenal over the course of the campaign. You should use them all too, if for no other reason than to see the animations. Zombies and plants alike are crisply drawn and brimming with personality, and you can really see the love that’s been poured into every frame. I appreciate the way PvZ2 mixes up the gameplay as well. There’s a heap of ways levels are shaped to create a new challenge – some have a standalone design, such as making you match symbols to kill zombies or plan your defensive formation in full before the enemies start rolling in. Others simply tweak the rules a little, limiting you to a specific set of plants, a certain amount of sun, having no more than a certain number of plants active at one time, getting through a level without losing more than X number of plants, or defeating a certain number of zombies within a set period of time. Most levels will throw a few stipulations at you simultaneously, creating some nice challenging combinations. I am telling you that this is a game that I will teach my children to play someday. The best example of how a great game should be like.